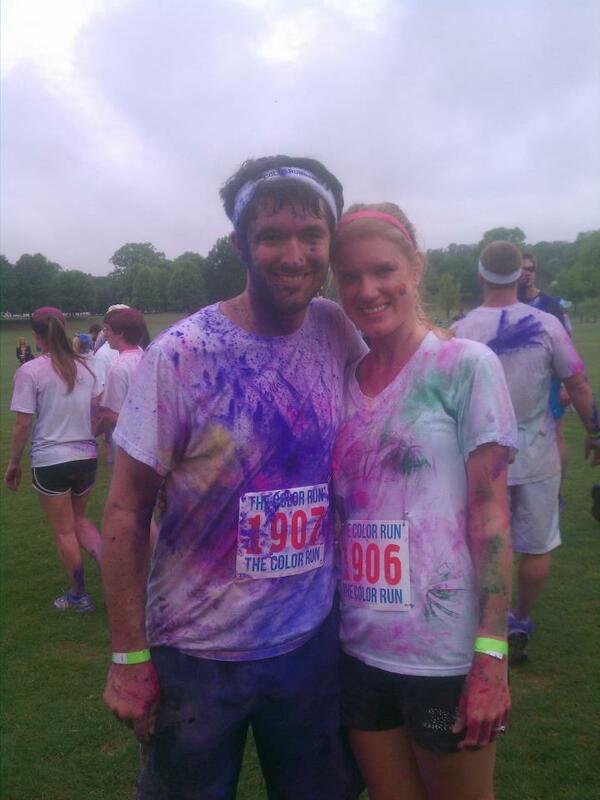 The Color Run…my first official 5K! I don’t like to get dirty. I’m not an obsessively tidy person that has to clean all the time (just ask Drew, or my parents who had to remind me to clean my room for 18 years). But, I really don’t like dirt. Having a dog living in a one bedroom apartment with us has quickly turned me into a loyal fan of Febreeze and an avid vacuum user. That being said, this past Saturday I put all dirt and grime qualms aside in the name of one epic morning of head-to-toe rainbow madness that can only be known as…The Color Run. 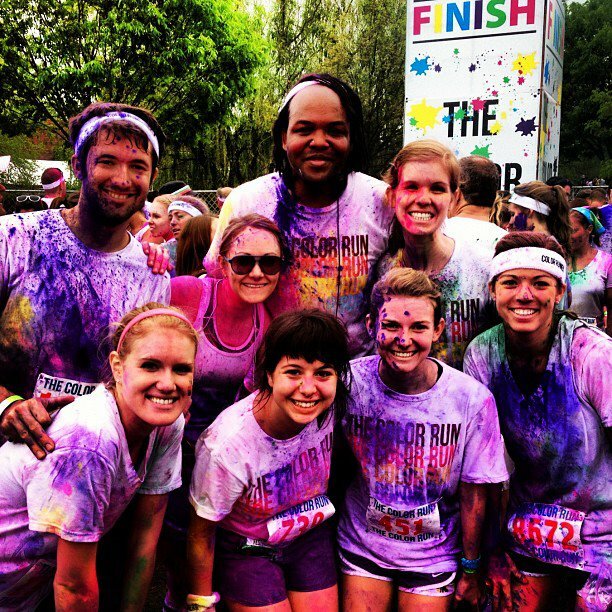 Several months back, Drew forwarded me a link to The Color Run’s website, explaining that a few of his co-workers were planning on running in the 5K. After watching the videos, instantly I told Drew to sign me up as well. Never mind the fact that I run indoors, or that I’ve never technically ran a 5K before. Sure, I log that kind of mileage on the treadmill on almost a daily basis, but running against the outdoor elements (hills, air pollution, weather and pollen, oh my!) is a totally different story. The few outdoor runs that I did accompany Drew on usually didn’t turn out for the best. 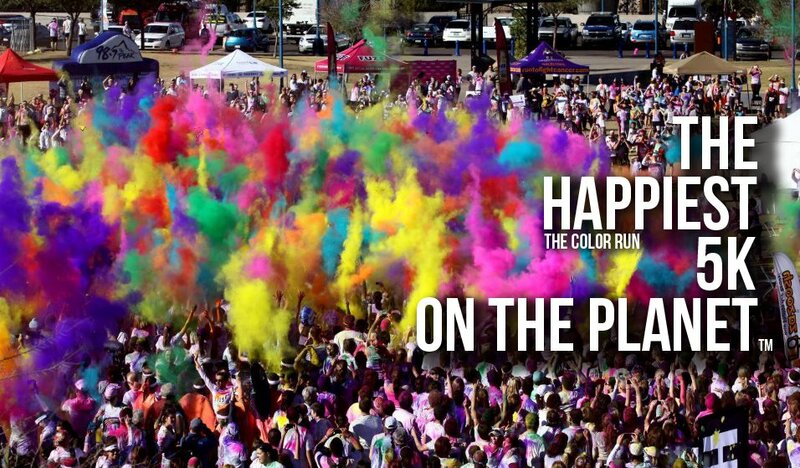 Still, I vowed to make The Color Run my first official outdoor race—since high school track anyway. Drew and I after the race. Fast forward to Saturday morning at 8 AM: Drew and I met up with three of our house church couples also running the race, and we headed over to Piedmont Park. We donned white shirts, colorful tattoos, neon shorts and race bibs. I was expecting the turnout to be much like the Firefly Run that Drew ran back in the fall, which topped out at maybe 1,000 people. Upon entering the park, we saw a line of runners that stretched at least half of a mile. No wonder the race created an encore for Atlanta the following weekend-there had to have been at least 20,000 people! Drew and I somehow managed to find his co-workers in the crowd and we queued up with them, awaiting the start. The Engauge gang...purple was definitely in abundance. Thanks to @ktmel for the awesome photo documenting! It turned out that running the race course the Saturday before with Drew–his birthday morning run, actually–was a really good idea. I had a better idea of what to expect. Even though a few of the hills made me want to stop, I kept trucking along until the finish line was in sight. 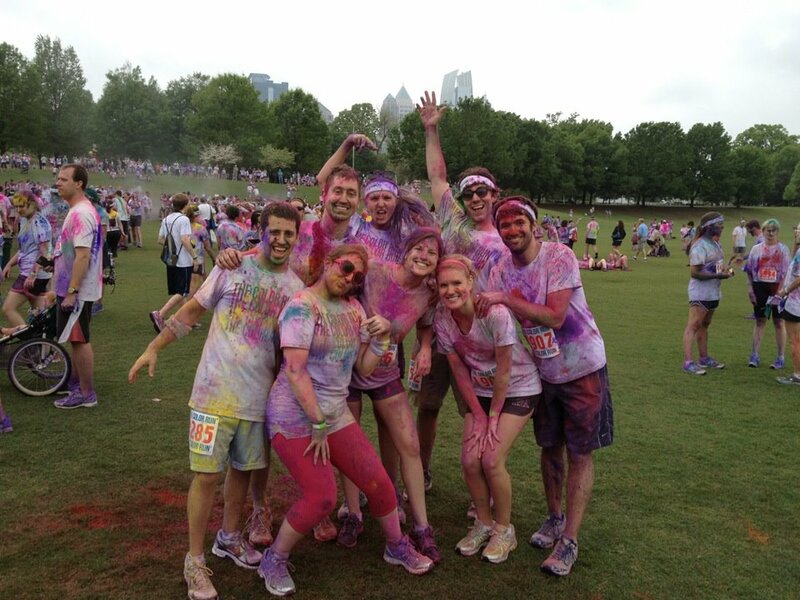 The first mile was more of a run-walk due to the sheer amount of people but it started to thin out and we logged 8 minutes each for the last two miles…pretty good considering we were getting showered with color! We ended up only running 2.9 miles; since there was such a big turnout we think they had to move the finish line closer in to give everyone enough room at the starting line. Our house church group...we had so much fun! 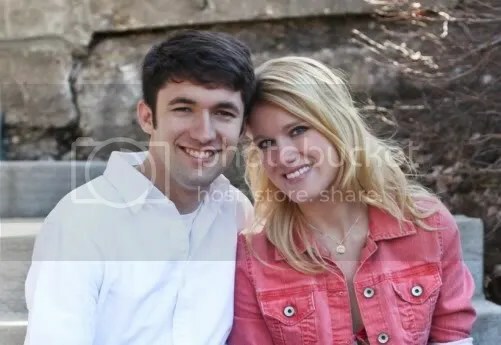 Looks like you two had a lot of fun! Loved the pictures you all posted on Facebook.